Black Pepper Essential Oil And Its Beneficial Aromatherapy Properties. Black pepper essential oil is stimulating, warming, very yang and is great for cheerfulness! It is very good for helping circulation, bruising and aching limbs, as well as promoting digestion. I use black pepper oil in aromatherapy massage blends for runners, cyclists and sports people in general who suffer from muscle stiffness and fatigue. Another thing I love is that a little black pepper can also give a subtle lift to many blends. Pepper is one of the oldest known spices and was being used in India over 4000 years ago. 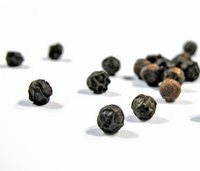 Attila the Hun is said to have demanded a ransom of 3,000 pounds of black peppercorns for the city of Rome! Pleasant, fresh, spicy and peppery - it has a bit of a kick! Black pepper essential oil is a warm and spicy oil good for boosting the immune and digestive system. Can also help with stimulating a lost appetite! Its warming qualities make it good for chesty colds and flu. It helps relieve muscular aches and pains and can help with rheumatic and arthritic pain. Black pepper can also be helpful for poor concentration or an apprehensive state of mind. Good for sluggish, dull skin. As a tonic it helps to balance oily skin conditions. Black pepper should be avoided in pregnancy because of its skin sensitising effect. Using too much could over-stimulate the kidneys.